Violence swept through Iraq on Wednesday, with fresh attacks bringing the country’s death toll to 35 people in two days. The assaults followed suicide bombings Tuesday night which killed 19 people, including 14 security force members. Attacks in Sunni districts of Baghdad left nine dead and more than 20 wounded, AFP reported, citing security and medical officials. 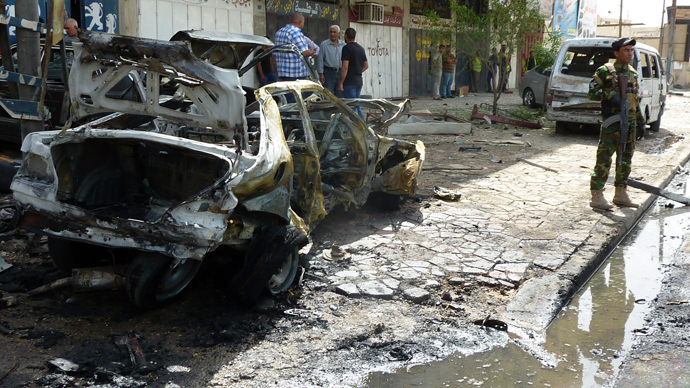 The deadliest assault was in Abu Ghraib, west of Baghdad, where two people were killed in a roadside bomb. In a separate incident, a magnetic sticky bomb attached to a car in the Adhamiyah neighborhood of the city killed a policeman. 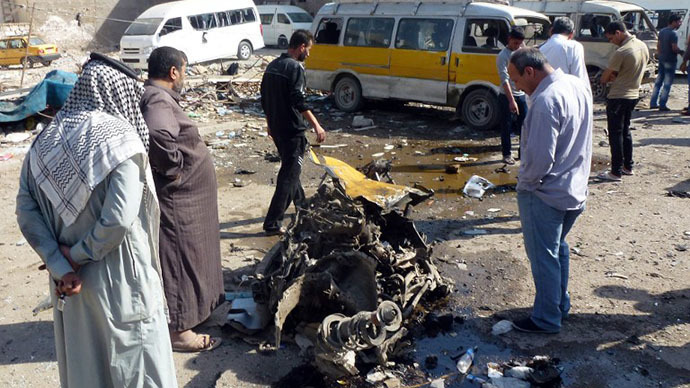 Other attacks Wednesday hit Baquba, in the center of the country, as well as Fallujah - a former bastion of Sunni insurgency. 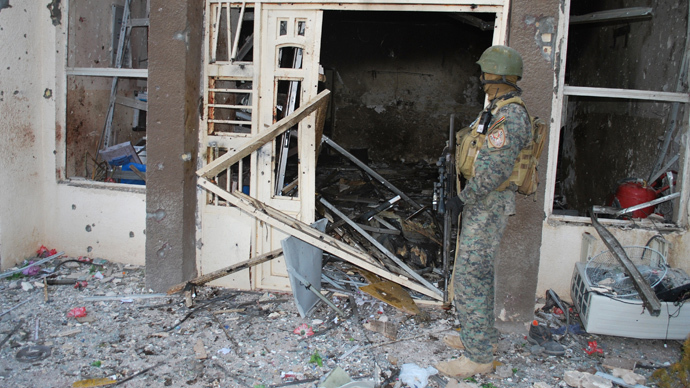 Attacks also hit the cities of Mosul, Kirkuk, and Tikrit. Wednesday’s violence followed a wave of suicide bombings on Tuesday night that killed 19 people, 14 of whom were security force members. In Tarmiyah, north of Baghdad, two suicide bombers attacked a house where a security meeting was taking place at 11:30pm local time. One bomber managed to get into the building itself while another detonated explosives at a gate to the house. Among the dead were four soldiers including a brigadier general, three police, and four Sahwa anti-Al-Qaeda fighters. Also on Tuesday, a suicide bomber blew up a vehicle rigged with explosives at a police check point, killing eight people - including three policemen - and wounding 25 others. Other isolated attacks killed seven others on Tuesday as Prime Minister Nuri al-Maliki left on a visit to Washington where US officials have offered to share intelligence and provide other military support to the embattled Iraqi leader. Thirty suicide bombers have detonated devices this month alone, while others were killed before they managed to do so. Overall, more than 700 people have been killed in October and over 5,400 since the start of the year. Since the beginning of 2013, there have been just 16 days in which there were no deaths from violence in Iraq. The most recent one was May 24, according to media estimates. Experts say the Iraqi government must look to long-term efforts which will begin to build trust among the shattered civilian population and especially among the isolated Sunni minority. But while authorities have raised the salaries of anti-Al-Qaeda fighters and freed some Sunni prisoners, many underlying issues remain unresolved. Sabah Al-Mukhtar, president of the Arab Lawyers Association, told RT that Washington’s sale of helicopters and other military hardware to Maliki can do nothing to help the security situation in Iraq. “These weapons will never deal with the terrorist acts that are taking place in Iraq. You don’t need airplanes to deal with bombs or vehicles that explode in markets. In fact, this is a cover for seeking the help of the USA to run for a third term. [Maliki] is going to show the US that unless he is re-elected, then Al-Qaeda is going to take over,” he said. Jeremy Corbin, a British Labor MP and president of Stop the War coalition, believes that nothing good will come out of Maliki’s trip to Washington and that only a truly representative government in Iraq can solve the country’s problems. “Surely the way forward is some kind of cohesion and comprehensive government in Iraq that seeks to represent all of the people in Iraq, rather than pursuing this,” he told RT.